Boogie Musical | Boogie Stomp! The show is inspired by Mr. Baldori’s professional relationship with Chuck Berry, who is labeled as one of the greatest pioneers in Rock n’ Roll history. The three elements that paved the way for rock n’ roll were experimentation with rhythm, syncopation, and improvisation, and the show uses a historically musical timeline to demonstrate each of these.The charismatic and playful banter between Baldori and Migliazza throughout Boogie Stomp! make the show all the more endearing to watch, as well as intrigue its audience members with the history behind the birth of blues and boogie-woogie music. It is the combination of Bob Baldori’s warm humor with soulful harmonica playing and the cool & effortless presence of Arthur Migliazza at the piano that makes Boogie Stomp! a show you won’t want to miss. The smooth yet zesty flow that this show contains transforms its show-goers into keen & attentive, desirable eared audience members. Get your mojo working and fire it up, with Boogie Stomp! Boogie Woogie, that classic blend of Blues, Rhythm & Blues, and Jazz, is back in New York City, thanks to John Campana’s Boogie Stomp!, featuring pianists extraordinaire Bob Baldori and Arthur Migliazza. First rising to fame in the early 1920’s, Boogie Woogie led the way for pop music in America in the 20th Century. A collection of classic hits that defined the genre as it is today, Boogie Stomp! is two hours of non-stop fun. From Muddy Waters to Chuck Berry, The Beach Boys, Buddy Holly and Benny Goodman, there is an eclectic enough offering in this show to get every audience member dancing in their seat. Performed by two bonafide Boogie Woogie experts, Baldori and Migliazza are positioned on stage next to each other in front of their dueling grand pianos. With a lifetime of experience in the business, Baldori has played with Chuck Berry for the past 40 years in over 100 performances. This is evident in his stylings, technique, and from the hilarious and entertaining stories that are told in between songs. As his counterpart, Migliazza is a skilled and formidable musical opponent. Together the two take turns singing, playing the piano or keyboard, or cracking jokes to the audience to vary the pace. Though the musicians are both technical and impressive throughout the entire evening, the most exciting and powerful moment of the evening is when Baldori breaks out his harmonica for a passionate and bluesy solo, while Migliazza leads the way on piano. In general, the evening is filled with a variety of songs that transcend genres and succeed in keeping things interesting. The pacing of the show is also expertly cultivated, and slower jazz tunes are bookended by upbeat dance tunes and crowd pleasing American Classics. Presented in Midtown, The Elektra Theater is an intimate space that has a classic vibe to it: that of the old late-night Jazz venues that didn’t rely on huge sound systems but rather the acoustic design of the space. Catering to nostalgia for a time when pop music was still young and much more influential, Boogie Stomp! is an enjoyable ride that succeeds in demonstrating the timelessness of the classic songs that paved the way for the contemporary music of today. You will have to search far and wide to find two pianists more talented than Bob Baldori and Arthur Migliazza. In John Campana’s BOOGIE STOMP these guys tear up two pianos as they take you on a musical odyssey through the history of Boogie Woogie. Defining this music genre as Rhythm, Improvisation, and Syncopation over the Blues, this 100-year journey includes songs influenced and perfected by the likes of Chuck Berry, Muddy Waters, Benny Goodman, Louis Prima, and many more legends. And it’s not just fantastic piano music you will hear. Baldori blows a mean harmonica and is handy with a more modern keyboard. Having worked with Chuck Berry for years, he is full of behind-the-scenes anecdotes along with a plentiful supply of corny jokes. He plays sublimely off of the younger Migliazza, both verbally and musically. There is no doubt that these two are thoroughly relishing what they are doing, and they work diligently to make sure that you enjoy it too. The whole experience is enhanced by vintage video projections and pictures. BOOGIE STOMP is a journey you will be glad you took – educational, inspirational, and just plain fun. Fantastic!! They kept he audience out late Lovin it. Bob and Arthur put on an energized and riveting show that kept our audience engaged throughout the evening. We clapped and smiled through a concert that was both educational and uplifting. From chord one, and through the show, I had to restrain myself from jumping up and dancing. These guys have the fastest fingers in the west, they sing, and Bob does a harmonica riff that’s like a Picasso painting- abstract, clear, and exciting. He’s a master. The intricate point, counter point of these two delightful piano magicians gives us a musical feast. It is directed with great flair by Kirk Gostowski. What a Show! of the past that defined the modern music of today. thanks to John Campana’s Boogie Stomp!, featuring pianists extraordinaire Bob Baldori and Arthur Migliazza. member dancing in their seat. business, Baldori has played with Chuck Berry for the past 40 years in over 100 performances. told in between songs. As his counterpart, Migliazza is a skilled and formidable musical opponent. Together the two take turns singing, playing the piano or keyboard, or cracking jokes to the audience to vary the pace. pacing of the show is also expertly cultivated, and slower jazz tunes are bookended by upbeat dance tunes and crowd pleasing American Classics. the old late­night Jazz venues that didn’t rely on huge sound systems but rather the acoustic design of the space. Catering to nostalgia for a time when pop music was still young and much more influential, Boogie Stomp! is an enjoyable ride that succeeds in demonstrating the timelessness of the classic songs that paved the way for the contemporary music of today. Settling into my seat, I wonder how a couple of guys and their pianos are going to create a two hour show, especially for crowds whose music appreciation comes from scrolling through their iPhones. But audiences are in the tremendously skilled hands of Bob Baldori and Arthur Migliazza. Starting from the earliest days of the sound, they let loose on “Boogie Woogie on the St. Louis Blues” by Earl “Fatha” Hines, a jazz pianist and Chicago band leader. Greats such as Dizzy Gillespie and Charlie Parker were members of the Hines big-band. As a very young kid in Chicago, Baldori saw Sonny Boy Williamson, who is considered the Godfather of the blues harp (harmonica) and wrote “Shake the Boogie” before he was murdered and another musician, Rice Miller, claimed his name and sound. Baldori is on the harmonica here while Migliazza works the piano, the two speaking/singing. Another songwriter who is showcased—Hersal Thomas—wrote “Suitcase Blues” before dying at age 20. Do you feel nostalgic? Do you feel like dancing? Or do you need an introduction to the world of boogie woogie? Whatever the case, Boogie Stomp! is the show to catch. From the moment you enter Elektra Theater, you are welcomed to an intimate and, at the same time, creatively charged space. The drapes and seats are deep red, and the two pianos are set partially facing each other and partially you, the audience. It feels as if you have come in while the musicians were taking a break from their rehearsal. When they enter the stage, they immediately let their energetic and rhythmical sound grab you, and you respond by tapping your feet almostwithout realizing it. Bob Baldori and Arthur Migliazza took us upon a wonderful journey which included 100 years of American piano music; they improvised, played solo, duets, and two pianos, and shared stories. A particularly interesting tale was about the “rent parties” that took place in the black households of the 1920s. Musicians were hosting gatherings where neighbors and friends were invited to listen to music and drink. The attendees were throwing money on the floor and the hosts were able to make their monthly rent that way. The audience was so impressed by this story that dollar bills from several directions started flying on stage! Their performances were enhanced by projections of historical footage, but, most importantly, by their genuine love for this music. Their sincere intention to communicate this made the audience participate, sing and clap along. Both performers are excellent musicians, and it is particularly interesting that they represent two different generations, being thus the embodiment of the show’s goal — connecting the past to the present and give it a future. The intimate atmosphere at the Elektra Theatre prepares its audiences with giddy excitement to enjoy Bob Baldori and Arthur Migliazza’s explosively memorable performances inBoogie Town!. This show is the most satisfying theatre experience everyone should have the opportunity to see. The production is a beautiful conglomerate of American Piano Music over the course of 100 years, which music lovers, new-comers to theatre and/or music, and professional musicians, can thoroughly enjoy. The show’s score is passionately played by a team of truly gifted artists: award-winning Blues and Boogie Woogie pianist Arthur Migliazza and the show’s producer, writer and professional pianist Bob Baldori. 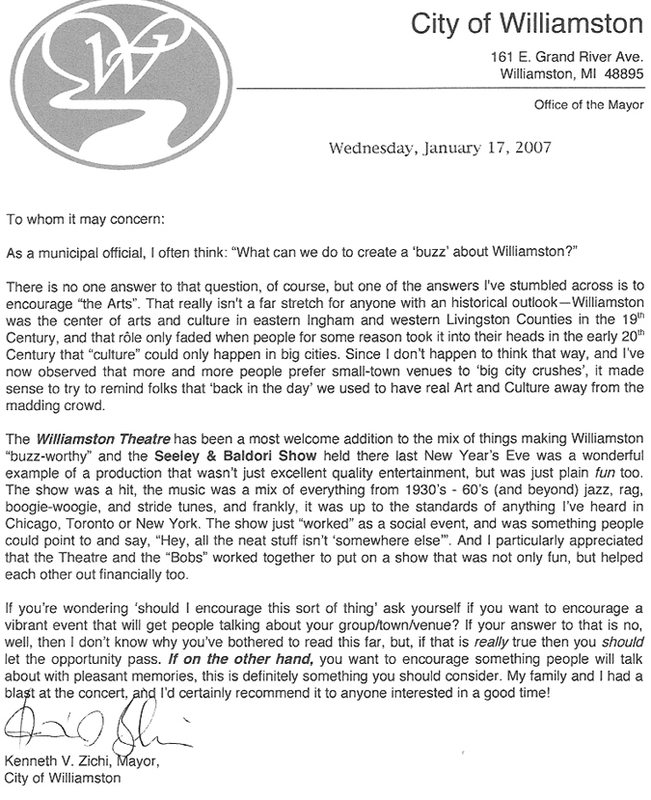 Baldori also directed the award-winning documentary Boogie Stomp!, on which the current stage play is based. 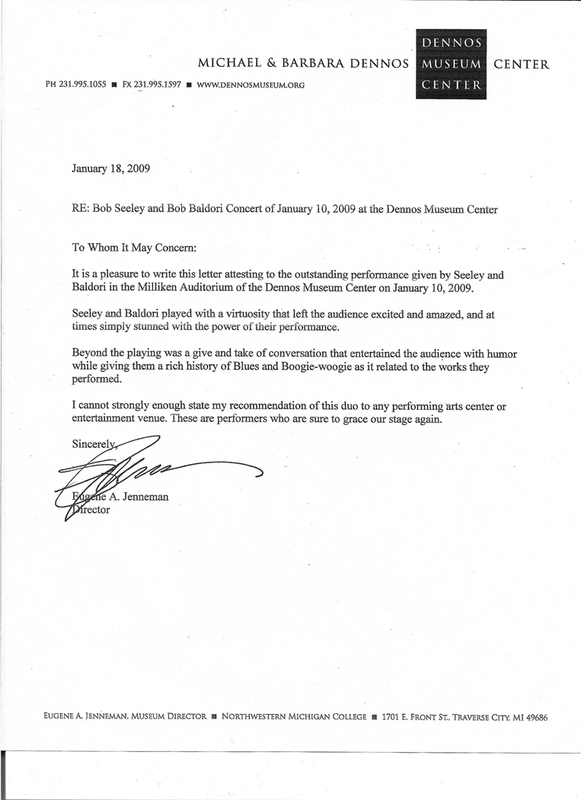 The show is inspired by Mr. Baldori’s professional relationship with Chuck Berry, who is labeled as one of the greatest pioneers in Rock n’ Roll history. The three elements that paved the way for rock n’ roll were experimentation with rhythm, syncopation, and improvisation, and the show uses a historically musical timeline to demonstrate each of these. The charismatic and playful banter between Baldori and Migliazza throughout Boogie Stomp! make the show all the more endearing to watch, as well as intrigue its audience members with the history behind the birth of blues and boogie-woogie music. Two extraordinary pianists, Bob Baldori and Arthur Migliazza, provide all the jivey music, the snappy commentary and the wonderfully playful fun in their hugely entertaining concert Boogie Stomp! Masters of their brand of keyboard artistry, namely playing/interpreting of Boogie Woogie, the Blues, and Ragtime, they notably bring two lifetimes of love and dedication to this totally American genre. Their love for this music is evident in every note they play, every song they sing and every comment they make. Baldori could use a little help picking out some nice looking clothes to wear (that Hawaiian shirt and skin tight jeans are pathetic), but once he gets to tickling those keys and on occasion playing his harmonica with awesome virtuosity, our attention is strictly on the music. He’s been playing the piano since he was 3, and also wrote and directed an award winning documentary, also titled Boogie Stomp! Baldori’s amazing career recording and performing with such jazz and blues luminaries as Chuck Berry, Muddy Waters, Bo Diddley among many others can be summed up simply by saying he is a truly terrific one-of-a-kind musician. He not only serves as primary narrator (the excellent text is credited to John Campana) of the history of the blues with which has been so closely identified, but fills the room with his enthusiasm and exuberant playing. Migliazza was also somewhat of a child prodigy and has played professionally since he was 13. His award-winning career, includes playing the Blues on some of the great stages of the world as well as being inducted into the Arizona Blues Hall of Fame. Good looking and younger than his partner, Migliazza is another dazzler on the keyboard and more than holds his own in contrast to Baldori’s quips with endearing and wry touches of humor. Together these two are tearing up the Electra Theatre with their piano artistry. They use their flawless techniques in a couple of duets that are astounding complex as well as fun to watch. These are spaced between solos, the show’s rather informal narrative thread and some nice visuals. A revelation to me is the influence on the blues made by the steam engines that powered the trains of yore with their rhythms and sounds. This is terrifically integrated into the program and accompanied by some creatively edited film clips of the old trains in motion. Lovers of the old trains, like myself, will be in a state of bliss. For many, however, the the background stories of their mentors and such legendary musicians as Bob Seeley, W.C. Handy, and Earl “fatha” Hines that provide an extra dimension to their music journey. But this is not a classroom but a party celebrating the social, economic and roots of the blues and the African-American culture. These two great guys seated (sometimes) at two grand pianos have previously shared their talents with audiences in Russia, Canada and South America, but a return to New York after a year’s absense means that anyone who missed them in their last visit is getting another chance. The joy and the excitement they generate with their own unique blend of (in their words) “rhythm, improvisation, and syncopation” is at the heart of their versions of blues, jazz, swing, as well as some R & B and Rock. Classics are highlighted but given a newly individualized identity through their piano artistry. You’ll be hard pressed not to swing and sway and jive with them as they shake the rafters with “St. Louis Blues,” Shake that Boogie,” “Bumble Boogie” and that show-stopping concerto based on the original Louis Prima song “Sing, Sing, Sing” (but made famous by Benny Goodman’s big band.) The audience at the performance I saw was unable to sit still and not become part of this terrific two hour celebration that’s been expertly directed by Kirk Gostkowski. The space was limited. Two beautiful pianos were in the center of the stage and nothing else. Because, ultimately, Boogie Stomp! wasn’t about production: it was about the music. And the gentlemen responsible for bringing this music to life? None other than Bob Baldori and Arthur Migliazza. These guys were clearly experts in their field and they oozedcharisma. Together, they gave me a thorough education in all things boogie woogie. It was amazing to see first hand that many of the different genres of music that we are so familiar with have borrowed from or were influenced by boogie woogie. It was the second weekend of “Boogie Stomp!” at Lansing’s Stormfield Theatre—but in another sense, on that Thursday evening on May 17th, it was very much opening night for Bob Baldori’s still-evolving piano-boogie revue. Many of the same numbers were on the program from the Seeley show: Baldori’s voice-and-harmonica rendering of Sonny Boy Williamson’s “Shake That Boogie,” piano duets like “Honky Tonk Train” and “Okemos Breakdown,” the elaborate schtick of the two-guys-on-one-piano set piece “Fourplay”—even Migliazza’s first solo, “St.Louis Blues,” was taken from the earlier repertoire of showstoppers. But whereas the 80-plus-year-old Seeley plays like a force of nature—a self-contained, strong-armed typhoon of a stylist—Migliazza is, ironically in many ways, just the opposite, and not just because he seems shockingly young. He’s a silky, urbane player, a Maserati to Seeley’s freight train, with a musically adventurous, playful streak that befits a young, 21st-century artist, and suggests his musical purview stretches well outside the borders of barrelhouse boogie. It gives the now-established revue a whole different feel. If “Boogie Stomp” was initially a case of Bob Baldori presenting the Old Master, and insinuating himself and his playing into the great Detroiter’s music, the Baldori-Migliazza version is more of a true duo, each player dishing it while creating an unwavering groove for the other. It’s instructive to see how Baldori, a formidable player with a serious resume and the long-lived nickname “Boogie Bob,” continues to pair himself up with players who can push him so hard. He’s performed the “Boogie Stomp” revue without Bob Seeley before—most notably with the German hotshot Martin Schmitt—but Arthur Migliazza, slack-jawed and slapping the floor with the soles of both dress shoes, seems almost to represent the new wave of this music: an irresistible, pedigreed old style with an explosion of youthful energy and new ideas. Who knew there would be a new wave of boogie-woogie? If indeed there is to be one, it all comes down to how it plays in the theater, in front of a live audience and—as we say here in the new century—in real time. Despite that it was their first night (or perhaps because of it), “Boogie Stomp” felt relaxed, spontaneous, even refreshingly unrehearsed at times, Baldori playing Mr. Interlocutor to Migliazza’s comic, occasionally subversive asides. 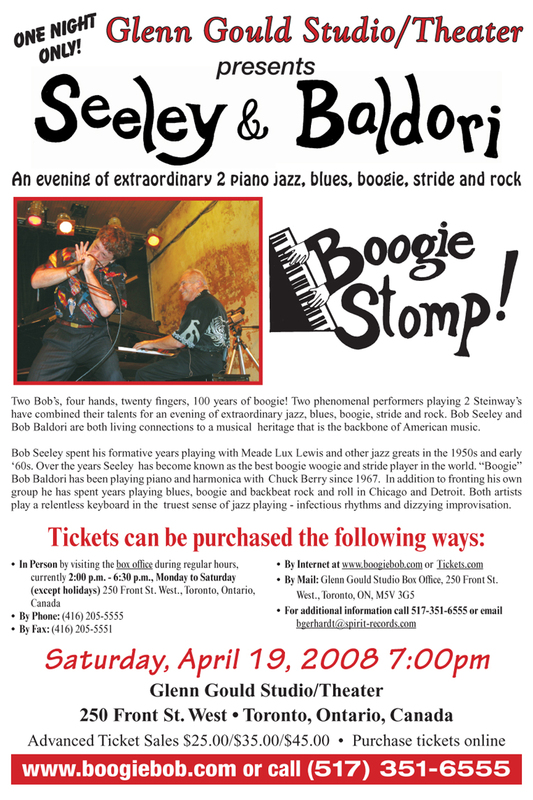 Without ever slowing down or becoming didactic, “Boogie Stomp” also managed to be a showcase not just for these two hotshots but for the story of this music’s cultural and historical context, from reference to the lumber camps and roadhouses that birthed so much American music, to Baldori’s nod to longtime associate Chuck Berry to the seismic channeling of greats Pete Johnson and Albert Ammons in their powerhouse duets. Boogie-woogie’s appeal is timeless; it’s no more an “acquired taste” than lunch at Paula Deen’s house: you’re gonna love it. But it’s the relationships—the modern-day top guns delivering the goods in this older style, the deceptively easy flow of the program, and mostly those magic moments that happen between two masterful, sympathetic players of different generations locked in together on stage, that made “Boogie Stomp” nothing less than exhilarating… and remember, this was only opening night. In the music world, the first name that pops to many people’s lips is Boogie Woogie Bob Baldori. A back-up pianist and harmonica player for Chuck Berry, he’s made a career out of playing the “happy blues” of boogie-woogie. It’s a history that Stormfield Theater is sharing with its audiences to close out its season in a performance of “Boogie Stomp!” In a series of concerts over two weekends, Baldori is partnering up with other boogie-woogie greats to put on a display of boogie-woogie piano music along with a smattering of the history and an explanation of what makes boogie woogie what it is. Together Baldori and Seeley present an evening of piano proficiency designed to excite an audience’s ears and eyes both. The keyboards are turned so the audience doesn’t have to miss a move and can delight to the dancing fingers. What made Baldori’s performance even more impressive opening night was that he was playing with a split index finger, bandaged to protect it. Yet there was no evidence of even the slightest hesitation or favoring of the finger. The two musicians, playing music that was at its popularity height in the ’30s and ’40s know how to entertain. Whether it is the humor of making a keyboard sing doo wops or the cheek-to-cheek playing with four hands on a single keyboard, they fill the evening with flair and fun. Boogie-woogie, which Baldori defined as rhythm and improvisation over the blues, wasn’t the music of concert halls. The skilled founders of the music played in backroom bars, speakeasies and night clubs. The music came out of the post-Civil War era when newly freed slaves were experiencing new opportunity to experiment with their music. The music was meant to make people dance – not anything slow and stately, but the fast patter of a beat that never stopped pumping. 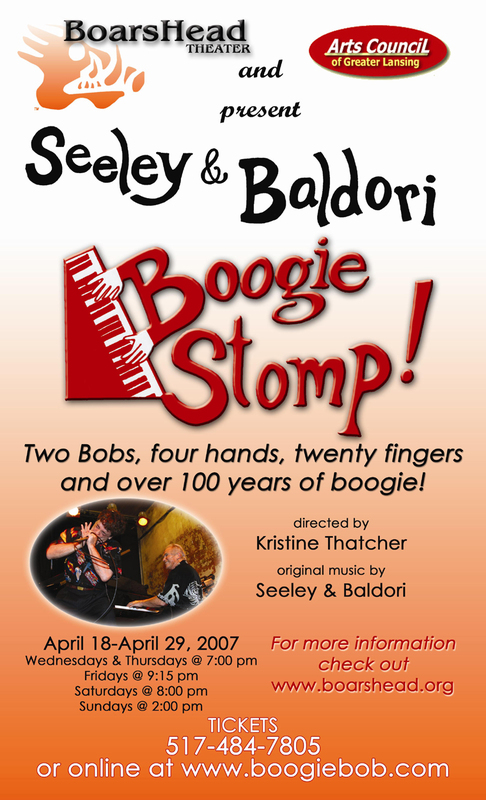 This is the story that Baldori and Seeley tell on Stormfield’s stage in “Boogie Stomp!” But ultimately it isn’t the words that communicate the story, it is the music and those non-stop fingers dancing over the keyboard. It is the pure passion which the two musicians pour into the piano, making the impressive grands practically jump on the stage. 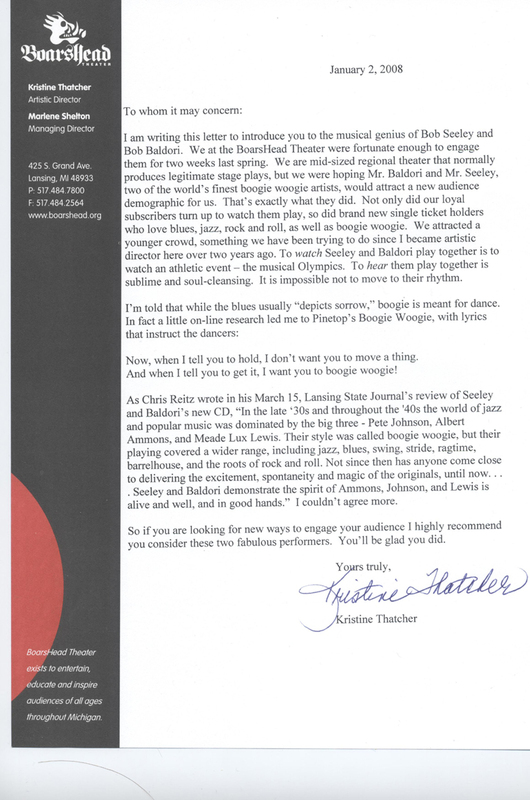 If rock and roll is, as John Sinclair said, “just R&B with a marketing twist,” then boogie woogie may be R&B with no marketing at all … except for Bob Baldori. 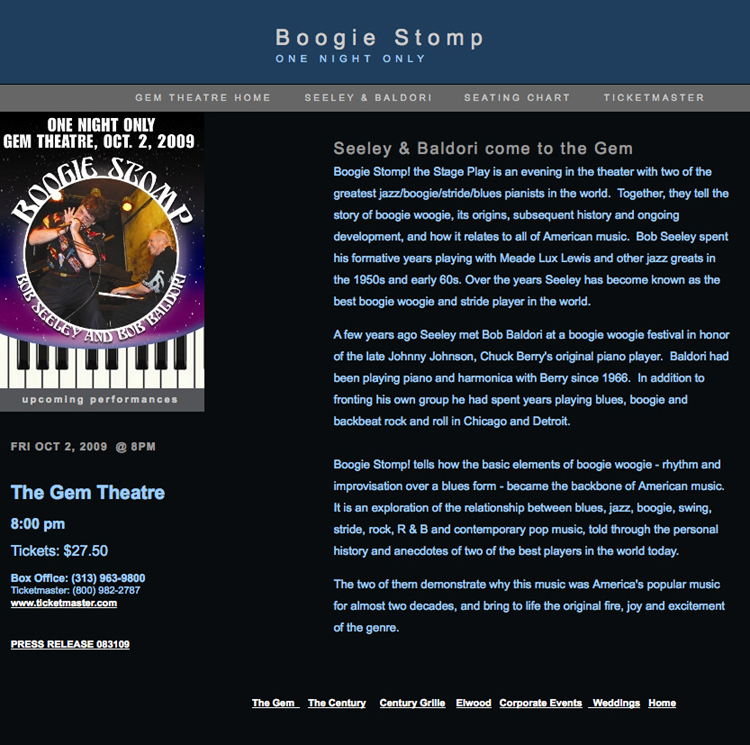 Bob Seeley and Bob Baldori walked in from opposite sides of the stage, seated themselves at their respective grand pianos and launched into “Boogie Stomp” a twinpiano showcase the like of which hasn’t been heard anywhere since the glory days of Pete Johnson and Albert Ammons. Then Seeley, 78 years old but seeming far younger, soloed on one of his longtime showpieces, “St. Louis Blues.” After about the sixth time through, the energy was ramped to a point at which most mortal men would bring it to a grand climax but Bob Seeley was just getting started. At least ten more choruses followed, each more stratospheric than the one before, an almost unbelievably virtuosic boogiewoogie tourdeforce. So it went on the evening of Friday April 27th, the tenth of a remarkably ambitious 12 day run at Lansing’s Boar’s Head Theater. It was billed as a musical revue, meaning there was a little more talk than the usual club date and dancing girls, too, on one number: “6 th Avenue Express,” probably the Boar’s Head’s first choreography to involve cell phones. But the schtick was largely reined in, and musicmaking ruled the night. The consensus on lifelong Detroiter Bob Seeley is that he’s likely the best boogie pianist alive, a genre that’s both technically forbidding and stylistically self contained. “Boogie” Bob Baldori also Detroit born is a happy foil for Seeley. He’s a formidable player himself, a generation younger, and something of a rocknroll renaissance man: charter member of the Woolies, longtime Chuck Berry sideman, theatrical producer, attorney, harmonica player, singer. “Boogie Stomp,” then, served first as a showcase for the estimable Seeley, and as a platform for the piano duets and despite that the sets were peppered with solos, and paced with Baldori singing and playing incredible harp, the duos were the night’s most magical moments. “Okemos Breakdown”a rerouting of Big Maceo Merriweather’s “Chicago Breakdown” jumped and sparkled in a way that can only happen in the push and pull between the right two players. It was such a natural sound, one forgets how thoroughly solo the art of boogie piano is, and how rare let’s say unheard of for a duo to click in this style. Ditto with “Boogie Rocks,” and their encore, which they played with all four hands on one piano, jostling with each other for position. Another magic moment was Baldori’s solo to open the second set: a gorgeous, gospel drenched reading of, of all things, “Tennessee Waltz,” a touch of sweet lyricism in an evening otherwise governed by train engine boogie relentlessness.